At Liftomatic Material Handling, Inc., we make the process of handling and storing waste easier, safer, and more productive. Serving municipalities, government entities, and private companies involved in the transport and storage of either hazardous or non-hazardous waste, we manufacture quality drum handling equipment that performs consistently and lasts a lifetime. 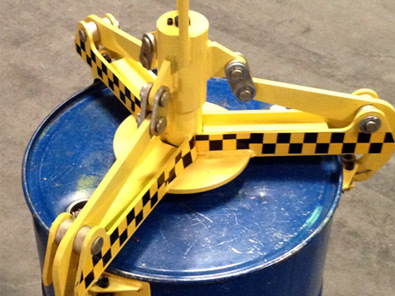 We offer proven solutions for handling steel, plastic, and fiber drums as well as overpack containers used with damaged or leaking drums for spill containment. Integral to our equipment is our patented Parrot Beak® technology, a remarkably simple yet completely secure solution that prevents drums from falling during transport. We also hold more than a dozen other patents on drum handling devices that hold them securely while lifting, palletizing, carrying, and dumping. 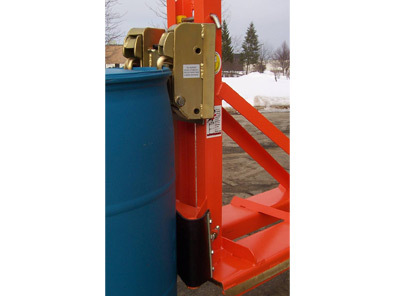 Our product line includes an extensive selection of portable equipment, forklift mounted drum handlers, and hoist/crane attachments for handling one to eight drums at a time. Along with an inventory of production models, we build custom and semi-custom equipment that meets your specific requirements. 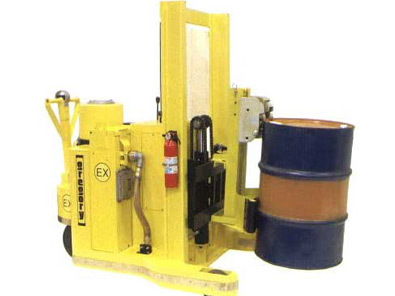 Whether you need an economical hand truck or an explosion-proof forklift-mounted device for transporting drums in Class 1, Division 1 hazardous locations, we have a solution that fits the exact needs of your business. Tapping into our 70 years of experience, we provide on-site consulting and engineering services for specialized waste handling and storage projects. Our client list includes the U.S. Department of Energy, military installations, and the world’s leading providers of environmental and industrial waste management services. To learn more about our drum handling solutions specifically geared for waste management, contact us directly. Drum and barrel handling equipment for all steel, plastic and fiber drums. Production models generally stock items. Custom manufacturing and designs by quotation. All storage, movement, warehousing and handling of steel, plastic and fiber drums and capabilities of handling overpack containers as well. On-site ROI analysis and consultation available. Custom design service available for specialized handling and storage requirements. Less than 1 Week (Capital Equipment). Custom designs by quotation.